John Drane's Introducing the New Testament has long been recognized as probably the most authoritative and accessible survey of the subject, both for students and for general readers. This classic work has been revised and updated, taking full account of recent scholarly developments and archaeological findings. These include areas such as the historical Jesus, the theologies of the four Gospels, and the role of St Paul in the transformation of Christianity from a first century Jewish sect into a separate movement that was to spread throughout the world. This authoritative text has now been further enhanced by the introduction throughout of full colour illustrations and photographs, maps and diagrams. 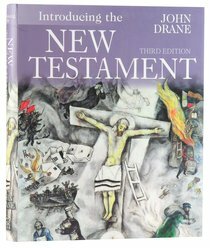 About "Introducing the New Testament (3rd Edition, 2010)"
John Drane (Ph.D., University of Manchester) taught practical theology in the universities of Stirling and Aberdeen, and is currently a Fellow of St John's College, Durham, and an adjunct professor at Fuller Theological Seminary, California. He is the author of many books including Introducing the New Testament (Third edition); Introducing the Old Testament; What is the New Age Still Saying to the Church? ; The McDonaldisation of the Church; Lion Illustrated Encyclopedia of the Bible; Cultural Change & Biblical Faith and Paul: Libertine or Legalist? Customer Reviews For "Introducing the New Testament (3rd Edition, 2010)"
Used as a textbook for NT Survey subject. Lots of diagrams and pictures. Helpful book.